The overall goal of the drilling campaign is the recovery of a complete stratigraphic sedimentary record on the southern Lomonosov Ridge to meet the highest priority paleoceanographic objective: the continuous long-term Cenozoic climate history of the central Arctic Ocean. 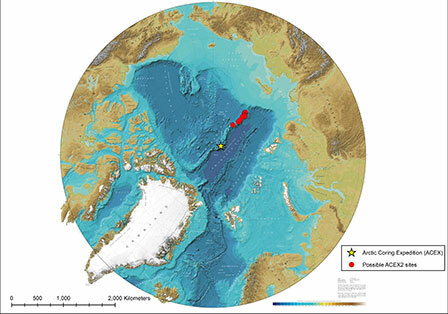 Furthermore, sedimentation rates two to four times higher than those at the site of IODP Expedition 302: ACEX permit higher-resolution studies of Arctic climate change in the Pleistocene and Neogene. This goal can be achieved by careful site selection, appropriate drilling technology, and applying multi-proxy approaches to paleoceanographic, paleoclimatic, and age-model reconstructions. To learn more about the scientific objectives of this expedition, life at sea, and how to apply to sail, please join us for a web-based seminar on Monday 22 May 2017 at 1pm GMT (日本時間：5月22日(月) 22時).